AAC files have the same dynamic range as CDs. Don't mind if i ask, but ever heard of 24/96 AAC files? Current Bluetooth (up to 4.2) limits AAC to 256Kbps - it might have been encoded from a 24 bit source, but decoding that level back into 24 bit probably wouldn't really get closer to the original than decoding into 16 bit at that sample rate. AAC can encode larger data rates of course for storing rather than streaming, so it's a good choice to use for 24 bit source files if you employ a larger data rate that can reproduce well back into 24-bit. That's exactly what AptX HD is, the larger data rate of 576 Kbps allows for better reproduction into 24 bit from 24 bit source files - not by a lot, but still mostly more accurate than 16 bit rendering. Personally, I would choose AAC over AptX HD at the same data rate, but Bluetooth doesn't allow it, so I use AptX HD. Is AptX MP4? I don’t know much about it. I kinda thought that but I didn't know for sure. Thanks for the info!! Just to make it clear though - lossy compression can't process information unless it's PCM to start with.... so the bit-depth of the original PCM and the resulting decoding are very important to quality of outcome. For example, AAC uses a discrete cosine transform as it's basis for compression - the key word being discrete, this is essentially what PCM data is, it needs to be of the same order of precision to maintain precision in the chain, so it is associated in that way. Garbage in, garbage out I suppose. And does anyone tried listening to music that has been "Mastered for iTunes"? And are those encoded as "24/96" 512 kbps AAC files? Yep...a rule that applies across the board......never stronger than the weakest link. Mastered for iTunes means that the source is a studio quality master (i.e. : 24/96), and the encoding is customized to make it as efficient and high quality as possible. But the end result is still AAC 256 VBR. That isn't a bad thing though, because AAC 256 VBR is audibly transparent. With human ears, you won't be able to discern it from the master. Apple has a curious habit of going around remastering Sun Ra albums. I imagine I am one of the few people who have noticed this. This can be a good thing because the production values of some Sun Ra recordings seem to have not been the best available, or, you might go so far as to say, comically bad. They used to have little news snippets about the apple remasters of Sun Ra albums but I can't find them anymore. I had a particular affection for this album as a young teenager. I had it on LP and searched far and wide for a CD of it. 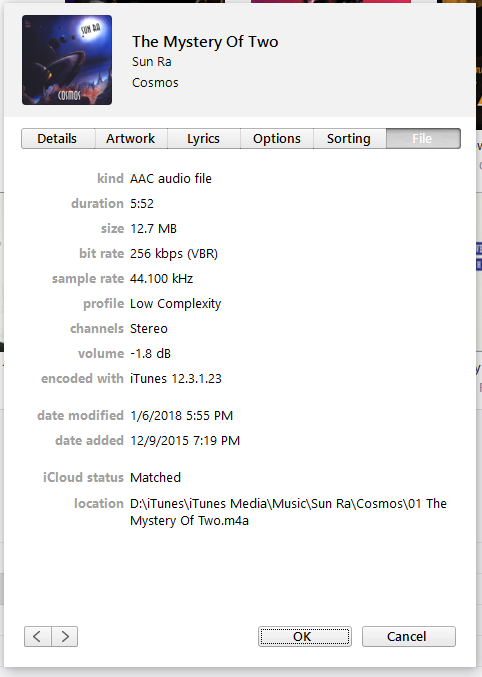 But anyway here is the song info from an itunes proprietary rip from what I think (if my memory serves me correctly) is a 2017 or 2018 Itunes Sun Ra remaster adjacent to the song info ripped from a CD that I bought in 2015. Now I could delete my 2015 CD-rip and Itunes will download and replace it with the "match" remastered 256 AAC Itunes file DRM-free because I have Apple Music, but for the time being I amuse myself by having both as long as I am subscribed to Apple Music. And in addition I think whatever they did to remaster it in 2015 or earlier was pretty darned impressive by itself. Whatever information you can glean from this, more power to you. The remastered for itunes stuff is still in 256 AAC, the best I can tell, and is indicated to have a sample rate of 44.100 khz. 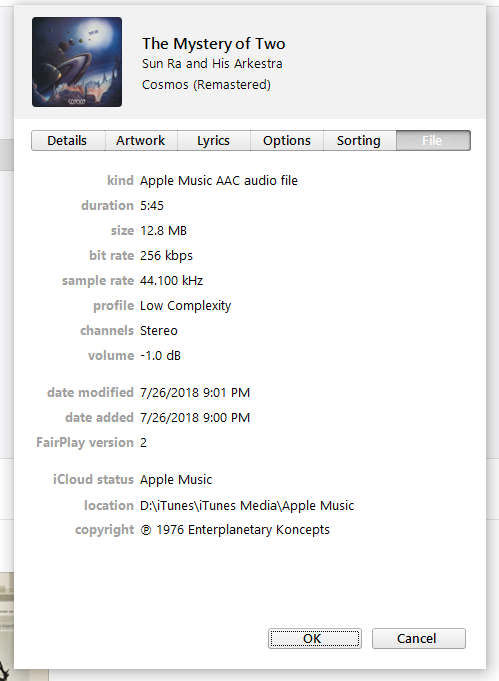 It looks like my CD rip was actually at a little higher volume (.8 db) than the itunes remaster rip, and you can also see differences in track length, file size, etc. I wonder if the track length is shorter in the Itunes remaster because they fixed the speed and the pitch. FWIW Foobar shows the CD VBR Itunes plus AAC rip to average 301 kbps. I did get to see Sun Ra live on two or three occasions. Memorable in the extreme. It could be that Apple rejected the master they were sent and the current rights holder had to go back and fix stuff. Sun Ra owned his own record label, wasn't he? He could be as sloppy as he wanted back in the day. @bigshot You might well be right! Sun Ra was such a difficult personality that it seems assembling his discography into a coherent narrative and assembling the best versions of his songs on a per-album basis has been an epic undertaking. Sometimes he owned his own label and sometimes he did not. Sometimes he played doo-wop and sometimes be-bop and sometimes he was just some spaced-out dude from Saturn. Nothing he ever said really made too much sense. It has also been said that he ran his band with a very heavy hand. I have read that if they were on a foreign gig and he did not like one of his musicians he would have the whole band leave the country without the telling the one person and leave that person behind and alone in a foreign land. I wasn't aware Itunes would send back music to be cleaned up before they would issue the music on its store. That makes sense for all of the recent Sun Ra remasters on Itunes, to include 2018 remasters, whereas Spotify will just have the older masters. and for this second link mouse over the picture and click on the drop-down menu stating "Cosmos (Remastered)" for more info. Or click on the play button to get a taste of the music, though the album is widely varied. At the drop-down link you can hear the whole album. "A hard-to-find, alternately chaotic and tightly organized mid-'70s session that was issued on the Cobra, and then Inner City labels. Sun Ra provided some stunning moments on the Rocksichord, while leading The Arkestra through stomping full-band cuts of atmospheric or alternately hard bop compositions, peeling off various saxophonists for skittering, screaming, at times spacey dialogues." COSMOS contains the only studio recordings captured in summer 1976 during the fourth European tour of Sun Ra and His Arkestra. Live recordings are known to exist from concerts in Switzerland, Italy, and France. Cosmos was issued in France in '76 on Cobra (identified as Blue Silver on the sleeve and label), in the US that same year on Inner City, in 1991 on Buda (France), and as a bootleg edition or two. Each time it resurfaced, the audio quality changed, sometimes for the better, sometimes not. On the 1991 CD, the bass was mixed at woofer-quaking levels; the Inner City LP sounds flat. In 2015, tape librarian/engineer Michael D. Anderson of the Sun Ra Music Archive began assembling a digital reissue. Tape could only be located for tracks 2, 3, and 4, and the various LP and CD configurations offered idiosyncratic production variants. Eventually, best quality recordings were extracted from a combination of sources: track 1 from the Inner City CD, and tracks 5, 6, and 7 from a near-mint Cobra LP. These were digitally remastered in several stages, to create an improvement over prior editions. Mastered for iTunes approved aggregators can send your high bit rate masters to iTunes, but, they can only guarantee that your release will be branded as "Mastered for iTunes" if your work has been mastered by a Mastered for iTunes Mastering Engineer.